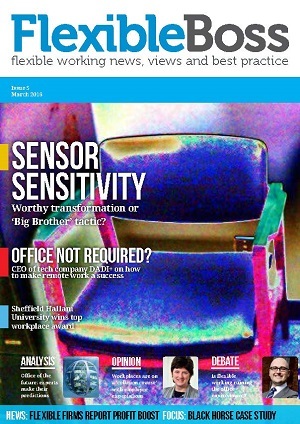 Flexible Boss Magazine is the quarterly source of news, features and comment on flexible working for employers. Read it online here. Better technology means organisations can radically change how they manage and motivate their teams. Keeping up with staff expectations, boosting productivity and cutting costs makes perfect sense, but enacting change can be challenging. With case studies and best practice from companies including Centrica, Unilever, Vodafone, Enterprise and Lloyds Banking Group, Flexible Boss explores all aspects of flexibility, from HR and policy to technology and property. Looking forward to seeing this. Well done FB. Excellent magazine with useful research and details, great first issue. Great range of topics on flexible working. Very pleased to have been directed to this online.